(Required) Field ID for the field of interest. Use these parameters to adjust the chart properties. Use ? to append the first parameter, and & for subsequent parameters. (Optional) Chart title. The default is the channel name. 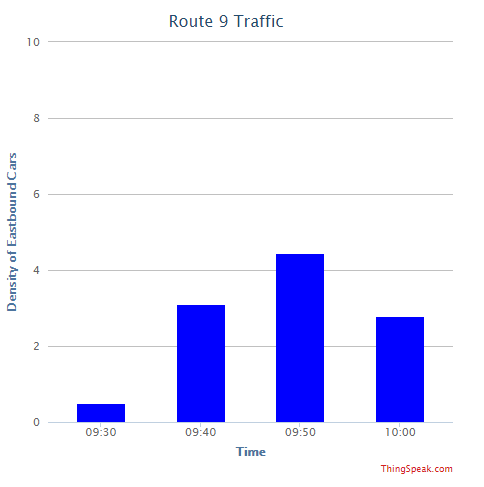 (Optional) Chart x-axis label. The default is "Date". (Optional) Chart y-axis label. The default is the field name. (Optional) Hex Value for line color. The default is FF000 (red). (Optional) Background color. The default is white. (Optional) Type of chart. The default is line. (Optional) Chart width in pixels, iframe width is 20 px larger, default chart width: 400. Set to auto to automatically adjust chart size based on its parent container. (Optional) Chart height in pixels, iframe height is 20 px larger, default chart height: 200. Set to auto to automatically adjust chart size based on its parent container. (Optional) Make chart update automatically based on the time interval mentioned in update. The default is false. step (Optional) Draw chart as a step chart. The default is false. Use these parameters to adjust the properties of the channel data used to generate the chart. If there are no previous parameters, use ? to append the first parameter, and & for subsequent parameters. Otherwise append all parameters with &. (Required) Specify User API key. This is different from a channel API key, and can be found on your profile page. (Optional) Number of entries to retrieve. The maximum number is 8000. The default is 100. (Optional) Number of 24-hour periods before now to include in feed. (Optional) Timezone offset used to display results. Use the timezone parameter for greater accuracy. (Optional) Maximum value to include in response. The response is a ThingSpeak chart. You can use your web browser to complete GET HTTP requests to the ThingSpeak™ RESTful API. To see the format for an HTTP response, click the link or copy it to your browser. The response is a chart that displays the soil moisture measurement with a pink line and a custom title and a wide view. The data is from a soil moisture monitor posting to ThingSpeak Channel 276330. The response is a chart that displays the average soil moisture values over a 240-minute window for four days, excluding any points with a value lower than 200. 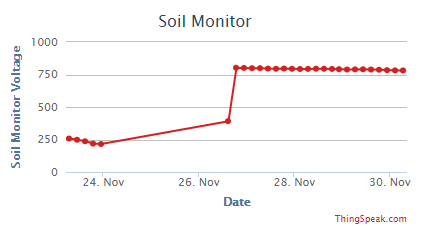 The data is from a soil moisture monitor posting to ThingSpeak Channel 276330. The example here will differ from what you see since the data is dynamic. The response is a chart that displays the average outside temperature values over a 10-minute window using the temperature data from field 2 of ThingSpeak Channel 9.